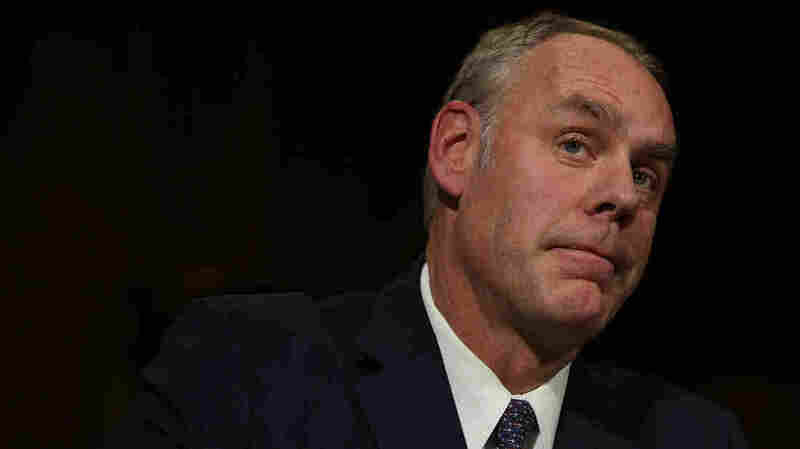 Emails Raise Questions About Interior Secretary Zinke's Link With Oil Executive Congressional Democrats and a public watchdog group are calling for an ethics investigation into the secretary over a land deal between Zinke's family foundation and oil and gas company Halliburton. Interior Secretary Ryan Zinke at his confirmation hearing last year. Congressional Democrats and a public watchdog group are calling for an ethics investigation into Zinke over a land deal between his family foundation and oil and gas company Halliburton. Craig Holman with public watchdog group Public Citizen says a real estate deal that involves an oilman and a public servant who oversees millions of acres of oil-rich federal land raises serious ethical questions. A previous version of this story incorrectly identified the group Public Citizen as Private Citizen. Previously posted June 22: A previous version of this story misspelled a reference to David Lesar's last name as Lasar.